There are over 40,000 different varieties of rice in the world. Of these, brown rice and white rice are the most common. Brown rice is whole grain rice with a mild nutty flavor. Though it does not taste as good as white rice still, it is considered more nutritious than white rice because it is less processed. This means that it contains more nutrients. Furthermore, brown rice has high fiber content. A study at the Harvard School of Public Health suggest replacing white rice in your diet with brown rice as it reduces the risk of developing type-2 diabetes. White rice, on the other hand, is easier to digest and contains resistant starch that helps improves the absorption of calcium and other minerals in the body. Basically, brown rice is unrefined as during its processing, only its outermost layer, that is, hull is removed. However, white rice is processed even further to remove the bran and most of the germ containing vital nutrients. Plus, white rice is also polished which removes its aleurone layer as it is highly susceptible to oxidation during the refining process. This layer too contains essential fats that are good for your health. Let’s have a look at the comparative analysis of brown rice and white rice. Both brown as well as white rice almost have the same amounts of calories and carbohydrates but brown rice has more fiber than white rice. A cup of cooked brown rice has three grams of dietary fiber whereas the same amount of white rice contains 0.5 grams of fiber. Studies have found that fiber helps lower colon cancer risk as it attaches to cancer-causing substances and helps to eliminate them from the body. Thus, it reduces the time these toxins spend in contact with colon cells. Plus, it contains selenium, a trace mineral that also reduces the risk of colon cancer. In addition to this, fiber promotes proper digestion and bowel movement, thereby relieving constipation. It also makes you feel fuller for longer and facilitates weight loss. Brown rice is an excellent source of manganese and other minerals such as magnesium and selenium. In fact, it contains twice the amount of manganese and phosphorus as compared to white rice. It also contains four times more vitamin B1, three times more vitamin B3, and two and a half times more iron than white rice as the milling and polishing destroy these nutrients. The manganese present in brown rice (one cup) provides almost 88% of the daily recommended value of this trace element in your diet. It ensures healthy brain and nerve function. Plus, it helps with calcium absorption, and carbohydrate and fat metabolism. Brown rice is also rich in selenium which helps in the treatment of heart disease and lowers the risk of developing cancer. As white rice is stripped of these nutrients, it is often enriched with some nutrients but this does not increase its nutritional value too much. As already mentioned, brown rice reduces the risk of type-2 diabetes. It helps stabilize blood sugar levels. Moreover, brown rice also protects against heart disease, gallstones, diverticular disease, metabolic syndrome, childhood asthma, and so on. It contains oil that lowers LDL or bad cholesterol levels. In fact, a study published in the American Heart Journal suggests that brown rice offers immense cardiovascular benefits for postmenopausal women as it slows the progression of atherosclerosis. Brown rice is also packed with phytonutrients that have anti-inflammatory properties and act as antioxidants. Thus, regular consumption of brown rice reduces cancer risk. Furthermore, being rich in magnesium, it promotes bone health. However, being unprocessed, brown rice also contains some anti-nutrients. White rice, on the other hand, does not offer such significant health benefits as it is stripped of the nutrients during the processing. Moreover, it is believed to raise the risk of developing type-2 diabetes as it is rich in starch. 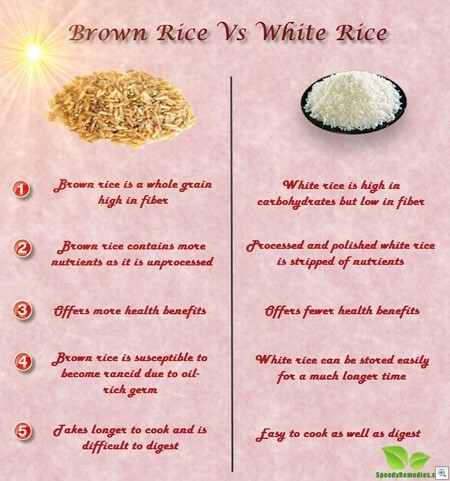 In terms of storage, white is better than brown rice because it lasts longer and can even be stored for a longer time. Brown rice usually goes rancid after six to eight months because of its natural oil. When stored in the refrigerator, it can last a little longer, that is eight to 12 months. Thus, it is generally suggested to store brown rice in a sealed airtight container in the refrigerator. Basically, the bran layer of brown rice contains essential fatty acids that go bad as they oxidize. White rice, on the other hand, can be stored for 25 to 30 years when sealed properly. Cooked brown rice usually lasts for four to five days when stored in the refrigerator. Cooked white rice can be stored in the refrigerator for five to seven days. Though healthier, brown rice is more difficult to digest when compared to white rice because of its high fiber content. In fact, white rice is usually considered good when dealing with gastrointestinal issues such as diarrhea, colitis, and the same because it is easy to digest. In addition, white rice takes lesser time to cook than brown rice.